This entry was posted in Book review, Buddhism, Philosophy and tagged Buddhism, Mind and Cosmos, philosophy, Thomas Nagel. Bookmark the permalink. “If materialism cannot explain consciousness, then materialism cannot be a complete explanation of the natural order. This argument is more interesting than it looks.” Really? Any decent sceptic could tell you that materialism can’t be a complete explanation of anything. But then nor can any other metaphysical theory, because it will be equally speculative and go equally far beyond experience. How then is it possible to come up with “a more satisfactory explanatory theory”? Nagel appears to be doing just the same as any other metaphysician, which is to selectively apply sceptical arguments to undermine the theories he dislikes, whilst ignoring the ways in which similar sceptical points would similarly undermine his supposedly more “satisfactory” alternatives. Pyrrho and the Buddha dismantled all this thousands of years ago, but nobody listens to them. It’s all a complete waste of time, and even less interesting than it looks. Hello Robert. As far as I can tell, Nagel does not employ sceptical arguments to undermine materialism, but on the contrary argues that materialism is partial and incomplete. I am all for sceptical arguments to undermine speculative metaphysics, but Nagel’s book is concerned not with speculative metaphysics but with materialism as the predominant metaphysical world view associated with modern scientific knowledge, which permeates the hearts and minds of all educated and no-so-educated western people. 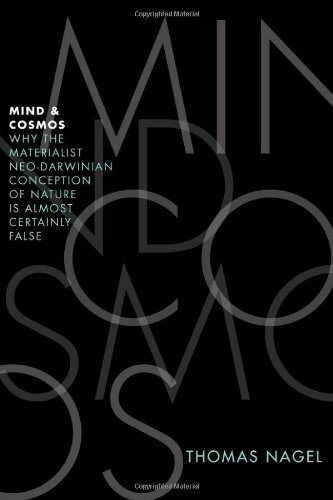 I think the moment for scepticism comes once actual doubt about materialism has arisen, and this book encourages that doubt to arise. Hello Rahula. ‘Intuitive non-materialism’ is a phrase I made up to describe (i) a view held intuitively, i.e. pre-theoretically, as a matter of common-sense or intuition, rather than necessarily as a result of rational reflection, and (ii) a view that the universe cannot be explained solely in terms of the matter and forces which modern science especially physics takes to be the basic stuff out of which everything is made. So to translate: an intuitive non-materialist is someone who thinks that there must be something more to life and consciousness than organisations of matter.